What's New Threads. The Calais cartoon. Thanks to the generosity of my crowd funders, I printed and distributed “about 12,000” copies of this cartoon. These were taken by grassroots refugee support groups and sold in aid of their regional efforts. Thanks everyone for getting this out there. I’ve nearly run out now. This is just the first thread of many more. 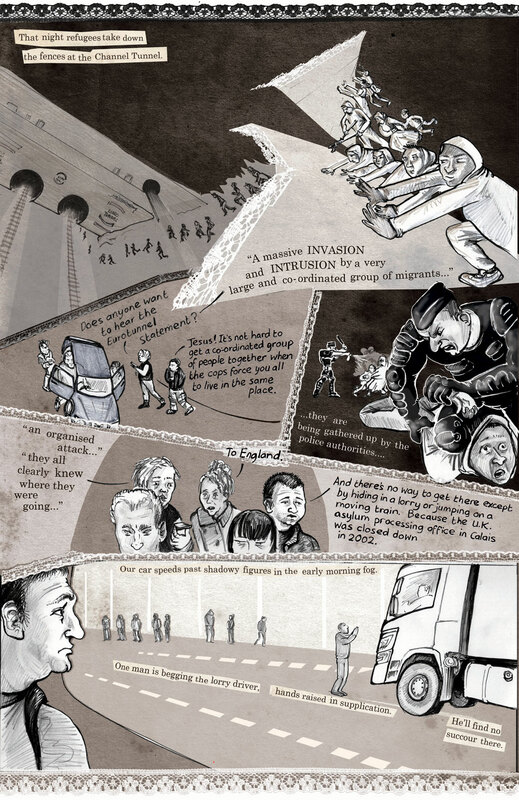 I’m currently working on the graphic novel Threads from the refugee crisis of which this comic forms the first chapter. Available 2017 from Verso books. Check the home page of this website, and my twitter feed @cartoonkate, and you can see artwork as I go along. So very clear and human and necessary. Beautifully made. Thank you for showing us. As with all of your excellent work, absolutely spot on! Absolutely heartbreaking! I was there when they were building it! If you know Graunia (I know that’s not how you spell it) the architect,please can you give her my love. The excellent work of the people who packed those trucks certainly showed so I’m glad to be able to give them some credit. The Irish mission was/is just awesome! I love you Kate for this. This is wonderful and painful and such a clear document of so much. Love the details you choose to share. Thank you for your work. This is such a great job. So skilled and so human. This really makes it real for me – not just a word or a news headline but real people. Beautifully told. Thank you. I cannot say enough about this most magnificent of journals. I hope that many will find the time to see this excellent, incredibly poignant work. 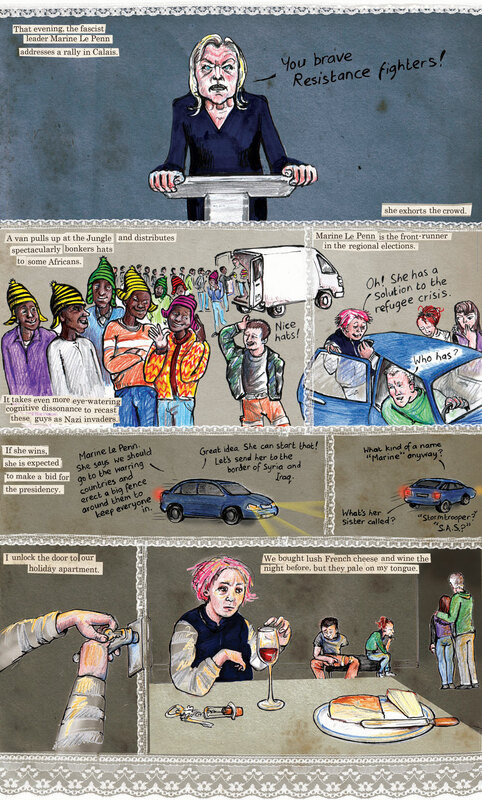 What an amazing piece of work, it describes incredibly well the situation in Calais, thanx sooo much! Crisis!What crisis? Thanks & so well done Kate,in the best traditions of cartooning,politioal or otherwise. Poignant, cutting,satirical,wryly humerous,yet with acid bites of irony. First hand? Reported,learned? Concise & eminently readable & coherent. Hard-hitting,informative. i hope our governments get their finger out and do something for them soon. Keep up your good work Kate, both on site there in Calais, and on paper with your beautiful drawings. What an beautiful and heartbreaking illustration of dignity surviving in a pool of man’s shameful neglect of man. Thank you. That was just wonderful. Thank you so much for summing up that tragedy so beautifully. I teach English in a Parisian engineering school and I’ve been racking my brain to find convincing material for a horribly racist class….. Could I possibly show them your drawings? Bravo for such wonderful insight. Of course! And tomorrow I’ll correct the spelling of Marine Le Pen’s name,before your class spot the error. 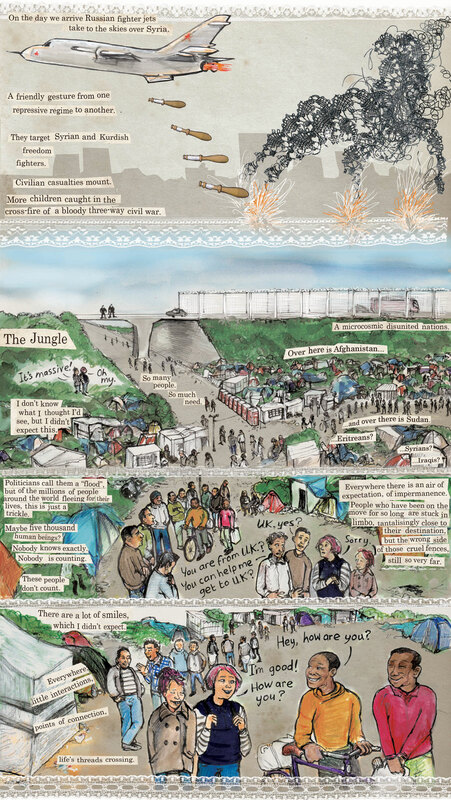 This is an immense piece of work Kate – portraying the camp and environment completely accurately, with beautiful poignancy and with just the right slashes of political comment. I hope you are able to permeate the psyche of this country with your cartoon. The only positive glimmer of light since your experience has been that France’s Supreme Court has criticised the French government and the Calais authority for allowing inhumane and degrading conditions in the camp and has ordered the authority  to ensure that children on their own are cared for and  to provide the site with more water points, loo facilities and refuse collections. C’est un grand et beau travail, humain, vrai, un reportage unique sur cette situation. 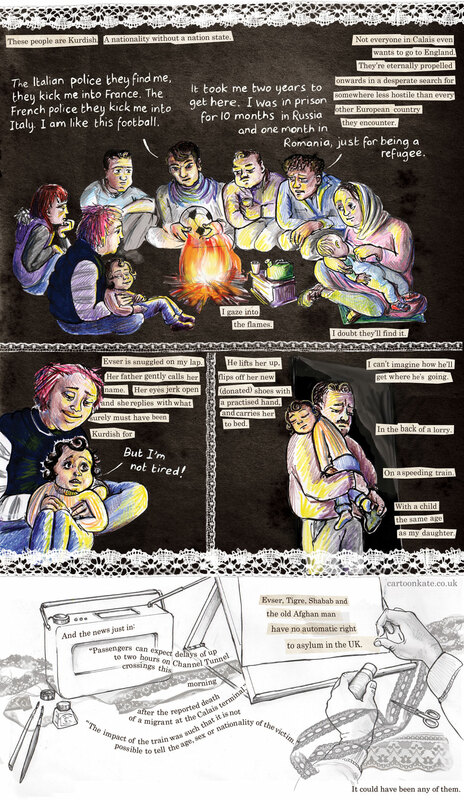 THE most poignant, powerful cartoon, ever drawn by man or woman, about refugees. You are a talent on a pedestal, where no man may look down on you! Thank you so very much for this piece of work. It brings to life all the news we read and hear from Calais. You have a real talent to telling a tale with humanity and humour. The very existence of the Calais camp is a cause for shame for Europe and the sanitary conditions there are stomach-churning. But you have brought to life the inextinguishable flames of humanity that still manage to shine, despite everything. This cartoon could not be better propaganda for battlefield veteran Islamic militant males invading Northern Europe if Lenin himself produced it. The situation would not exist if they very people breaking laws in Calais did not ruin their homelands with ethnic/religious hatred, intolerance, and war. You are importing death. I moderate my comments and I didn’t have to approve this, but then I don’t see why my blog should be an echo chamber of complimentary views. ISIS want you to think that the people fleeing their horrific regime are terrorists and deny them asylum. Well done. I’m curious. How old does a child have to be for you to be scared of them? Is Shabab old enough to freak you out? How about Evser? Half of the 19.5 million global refugees are children. Importing death? Really? Whereas dropping bombs and selling arms isn’t exporting it? Sleep well, Sue. Don’t have nightmares. Oh, really? I suppose bombing them some more will make them realise how wrong they were to try and escape, and they’ll all go home. I hope I never meet you, especially in times of need. I love this mixture of Lenin and Islamic Militant males!! I laughed at that! Sue Tross has NO understanding of the Calais disaster; she displays as much empathy as a UKIP supporter. Children are there, Sue Tross, children! Syrian men, women and children have been killed by the “Islamic militants males” in Syria! That’s why there’re fleeing!!! There is a civil war going on in Syria, where Assad and Govt troops used chemical weapons on the civilian population (Sarin gas). 300,000 have died in Syria. No mother would risk fleeing with their children, if it was safer to stay!! Look at the thousands of deaths, by drowning, in the Mediterranean Sea!! 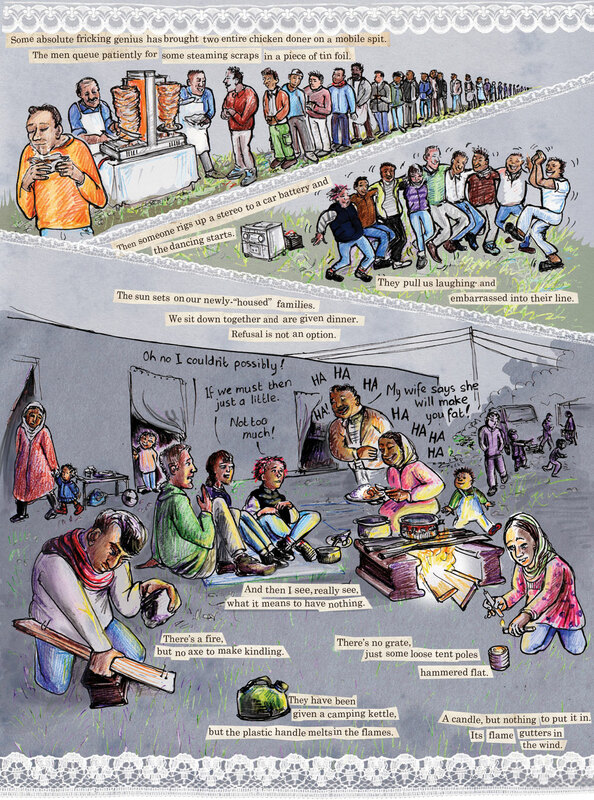 This “tapestry” exemplifies the Calais crisis like no other cartoonist in the World has done!!! First of all, Kate, you show an insight, a humble yet painfully humorous humanity that is desperately needed in these times. You are a blessing to us all, most of all to the dispossessed and displaced victims of a cruel war, waged by fanatics from all sides. The media brainwashing that sad and fearful people like Sue have fallen prey to is all pervasive and perverse. Your story, beautifully and truthfully told has moved many, including myself. Let us all stand together with the victims of injustice and war. I will share this on my FB page and ask others to do likewise. I have donated and will continue to donate whatever I can. Thank you, thank you, thank you! You realise that refugee’s were more at risk from ‘Islamic militant males’ than you ever have, or ever will be. And to say that it is their own fault that they have had to flee shows how little you understand about forgiven policy and long term effects if living in a area that is politically unstable as a result of wars… It also shows just how little empathy you have for your fellow human. This Cartoon is refreshing as it brings a much less politically stereotyped version of the ‘jungle’ than carried in the mainstream media. Ultimately the people of the ‘jungle’ are people, and people really are just people! Here we see people faced with an uncertain future as winter comes closer and they are faced with this stark predicament. Sharing time with people as Kate does and getting to know them as real people is something that is lacking from commercially driven news reports. I think that in fact the cartoon is the opposite of propaganda, as the cartoon has no aim to distort the truth but to say things in full as unfolding experiences; whereas propaganda – being the antithesis of this seeks to select and distort. Amazing, moving stuff, Kate. We have no idea. Your hostile commentators ar such ill in formed prejudiced people. There was only one troll. Best not feed her! I especially love the range of characters – especially the ‘chancer’ and the little girl who doesn’t want to go to bed. Beautifully observed. Fantastic. Very, very moving. Thank you Kate. 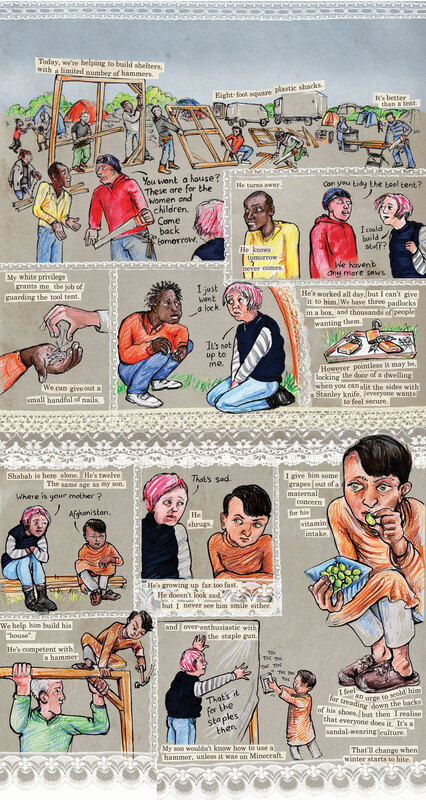 dear Cartoon Kate, A heartfelt thank you for your detailed, compassionate, vivid images. As a writer, I feel passionately that all arts workers have a role to play in illuminating the darkest sides of our world, the appalling things that people cannot begin to imagine. It is very hard for apologists for the status quo to dismiss these honest reflections of your experience. That man who said ‘David Cameron is a good man’ – he brought tears to my eyes. Thank you for the work you do and for sharing your amazing, beautiful art journal teaching us about this horrific problem. My heart aches for the refugees! I hope life gets easier for them. I will share this. Hello Kate! This is really brilliant – am so pleased to have stumbled upon it. Like another comment said, it’s a great way to tell us about your experience at Calais from the perspective of someone with no agenda other than to help people who need it. A moving account, told with honesty and compassion, it shows us the stark reality people are facing there every day. I hope Cameron and his cronies read this as they certainly won’t be popping down there themselves any time soon! A very accurate description of the situation. I was there delivering stuff a few weeks ago. It is an unprecedented humanitarian crisis. We live such comfortable lives. This should shake our complacency and remind us that people are more important than money and possessions. The humour made it even more real and poignant. you have drawn so many thousands of words that i cannot find to explain a part of the madness that is the Jungle. This helps so much in explaining the situation to others. Thanks for documenting this–and trying to help. Brilliant Kate – So glad that our Sunny Jim and his brother Joe don’t have to go through all that. We’re giving our caravan away to some refugees in Calais and your cartoon simply makes it feel right that we do. Beautiful work, warm and human and powerful. What wonderful cartoons-thank you so much for sharing. Have you tried to get them printed in any of the papers? Thanks for showing that way the nightmare we’re living here in Calais. Bravo. Since I’m not currently living it, it’s the least I could do. Hi Kate, thank you so much for this work. 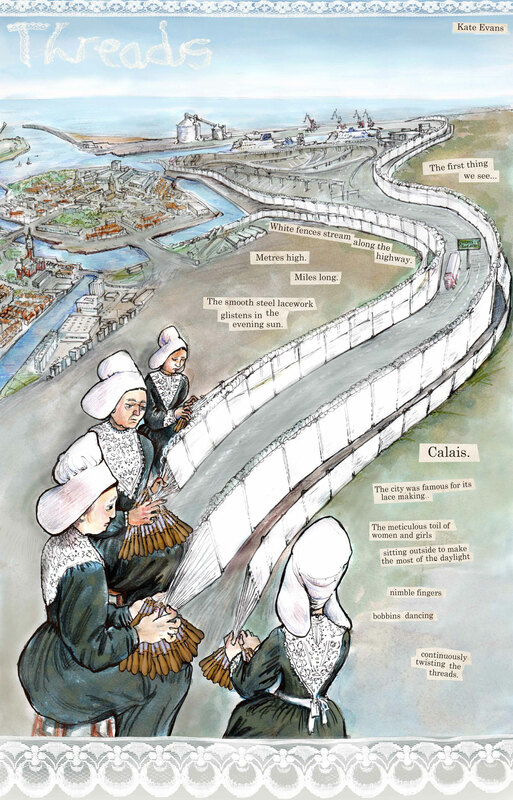 We live in Calais and we very much appreciate your cartoon but there is one thing incorrect : in Calais lace is not made by hand and bobbins, it is more like that. But no! 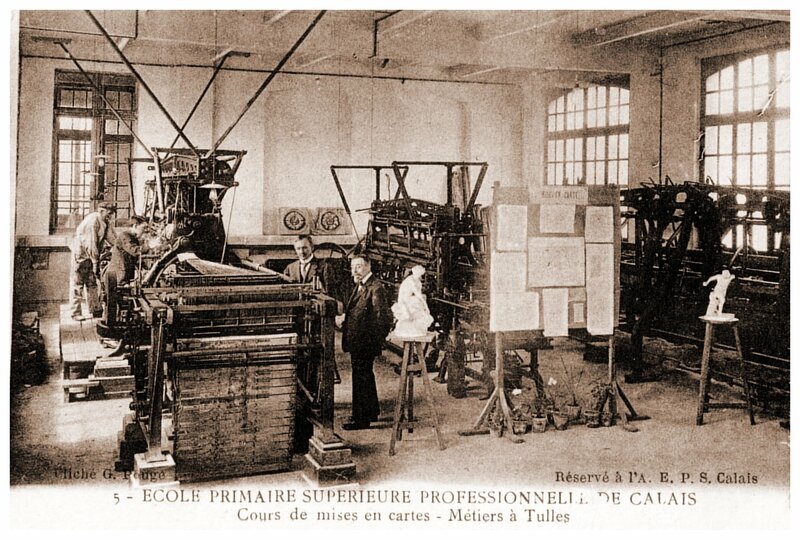 The industrial Calais lace machines replaced hand weaving, but there was a strong hand weaving tradition before that which was deliberately imported from, I think, Italy, in the eighteenth century. Anyway, I went to the lace museum and sourced the picture and the technique from the local area. Merci Kate pour cette Bande Dessinée qui est si réaliste.. Thank you thank you thank you! If this could get published….. in papers, as a pamphlet, on the internet as widely as possible …. Beautiful. Brilliant. Heart-filling. Heart-breaking. Thank you. 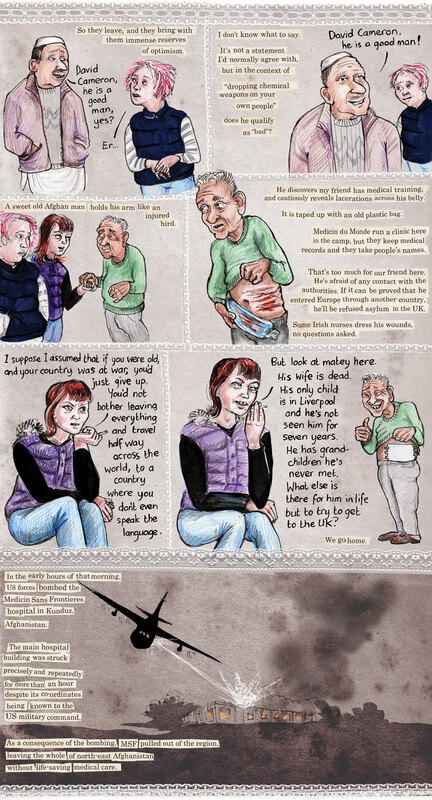 a very moving depiction of a truly horrific situation thank you for sharing this with us kate. Fantastic work, refreshing, heart-breaking, honest.. not to mention the brilliant drawings, I want everyone to see it. Thank you. You’ve left me in tears. Beautifully captured. Theresa May looking Cruella-Deville-ish is priceless. Loved it Kate, so well told in word and picture and filled some gaps from Sharyn’s trip, Am planning to go too. keep up the critical journalism – but sure you don’t need telling as I am sure you will. Love and more love. Worrying, wondering, fearing the future, looking for answers, not knowing what will happen- these emotions are from residents in UK so accurate and truthful journalism is essential . Thank you. Reading all the comments, everything I want to say has already been said. So I will just say thank you so very much Kate. And thank you to all the other people volunteering in Calais. And thank you to the refugees for humbling me with their humanity in the face of our so called leaders lack of humanity. This is wonderful. Just got back from volunteering in the Good Chance Theatre in the Jungle. I am still filled with questions and unsure what to do next. I was very moved to read your story which is filled with many of the same questions and contradictions (and humour and smiles) I felt. I will donate and spread the word! Thank you! 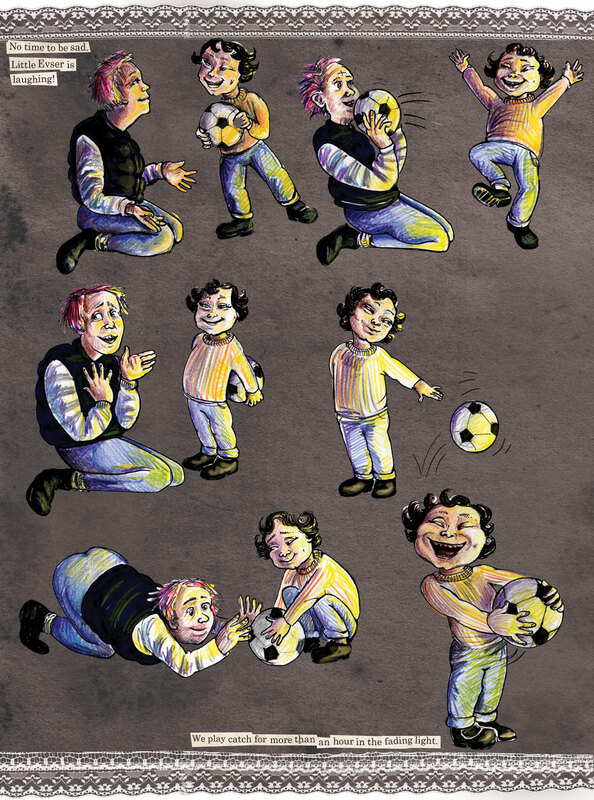 This wonderful cartoon is bringing people together in unexpected ways. Emily, I saw a news item about a theatre company in Calais and was so glad to see this happening. If I’d been in my twenties I would have been there like a shot. I wonder if you’re going to write about your experiences? I hope so. Thanks to both you and Kate for going there. Donating is a fine idea!. Thank you Kate. I am getting old now and wonder what we can do effectively to change this situation. Perhaps it’s the small things as well as the large ones. In Birmingham we have a Church sponsored agency called Restore. For over 10 years now they have offered befriending and so much more. And we have learned even more. What I can do is to go into the neighbouring mosque once a week and sit with the men in their time of prayer- and pray my own prayers with them. They are so generous and helpful. What will emerge from this short journey-who can tell? What a gift you have Kate. Keep helping us to see and smell and feel as well as discuss and debate. Age is no barrier. We need a mass movement. This isn’t a refugee crisis, it’s a protection crisis. It’s about recognising our common humanity on the most fundamental level. If you have the will, or the time, or the funds, you can help. Really impressive art-work. I think the lace borders are brilliant. Your cartoons really bring the plight of the refugees home and you’ve added a touch of humour alongside the sad reality. Will definitely share and maybe do a print run. Really beautifully drawn and observed. Thank you so much. I will try and share this as much as possible in the schools I work in. Thank you, Kate ! Brilliant and heartbreaking . Love you and your work, your courage!!!! Thank you for using your remarkable talent in this stunning and eye-opening way! Words alone are not enough but these cartoons do the perfect job! Poorly drawn, ideologically oriented. You’re a Fabian socialist? I’m a human being. The “ideology” comes from encountering other human beings in need. You should be in Calais helping…. you are so brave with your Cartoon. Yeah, but I have kids who need me here too. Everyone should be in Calais helping. You missed off throwing bricks at Lorry drivers and abusing women across Europe. Y,know, when people post negative comments, it shows this cartoon is being seen widely, by people with all opinions. I feel a lot of sympathy with truckers going through Calais; they’re being put in an impossible position. They need a solution to the hiatus at the UK border as much as the people seeking asylum do. This cartoon documents what I saw. I saw people standing by the side of the road, and one man begging and praying. There were no bricks. If you want to travel to the Jungle, meet people and hear their stories, then tell me you know the full picture, then please do. Kate, I wonder if you know about TrollAid? Other charities supporting refugees in Calais and Dunkirk have suggested that people who empathise with these charities’ aims should donate money every time a troll posts a comment. So, the more trolls, the more money they will raise to help refugees. I’m not pointing the finger at any one person here, and it may not be a problem for you, but thought I’d pass this on as a creative solution to a perennial problem. Yes I know. It’s hilarious. But technically, this isn’t trolling. Nobody is coming to this page with the purpose of being offensive, or bullying. People do feel genuine fear about “others” “invading” our country. It’s misplaced and irrational judgemental bigotry but it’s important to acknowledge and counter it. I’m glad to hear it. That you don’t get trolled, I mean. Good luck with your work. Thank you for doing this Cartoon Kate 🙂 Such a heartwarming gesture. With increasing environmental problems, drought, famine, wars over resources, pollution, etc., do you really think it is possible to give everyone in the world refuge who needs it – both now and in the future? If not, what will drawing the line look like and when do you draw it? If you think we can give refuge to anyone that needs it, where are these never-ending resources, space, jobs, homes going to come from? I will not respond to anyone who does not, at least, consider those very real questions. Just one example: Around 1.5 billion people rely on fish alone for their main source of food. By 2050, most Oceanographers now agree that there will be no more fish to eat. Will not the need of those 1.5 billion people be just as great as for those fleeing war, if not greater? My view is that you are offering false hopes. For every refugee you help, there will be hundreds of others following to live in squalor because they heard about that help. We should stop putting plasters on situations with no real long-term solutions, where only ordinary, often, poorest, people of European nations have to live with the consequences. This is false humanitarism and is completely ignorant of longer-term consequences. Why didn’t these people buy seeds and grow food with their money instead of paying pirates to cross into Europe? I’d rather die fighting for good values, than live in that dump, relying on handouts and anyone that encourages that is a fake humanitarian whose beliefs are as flimsy as the walls of that tent you sit in front of to stop people walking over you when they need to. You are the locks that do no good. Mmm, there writes someone who’s happy to watch 1.5 billion people starve to death. There is quite a lot I could say in response (I could easily rise to assertions you casually make such as “more than one child equates to living decently”, indeed!). However I think with respect to Kate and her excellent work we should leave this thread which is intended to to reflect her cartoon, ( a cartoon simply informing of the day to day life of those people who have a different circumstance to those faced by those such as you and I), If you should care to email me on cjblundell1@aol.com we can continue the discourse. M Knight – I listened to the Radio this morning, how the people in Yorkshire helped each other out when they got flooded. Everybody helped those in need, with whatever was needed. They still are. Of course that does not mean that the underlying broader issue of flood defences does not need to be addressed. But that is not the way to think when there is a humanitarian crisis. It is not that dissimilar with the refugees: they need immediate help. The underlying issues, the wars, are in the hands of the politicians. The refugee crisis is not just a political crisis, but a humanitarian one. There is no place for ‘drawing a line’ when it comes to an emergency. Good values? Don’t these values include helping someone in need? This should be published on one of the broad sheets. Thanks Kate, truly moving piece. This motivated me to do something. Thanks so much for a wonderful antidote to the ignorance and misinformation that leads to fear and hatred. Am posting on Ipswich Greens and local NUT pages to spread your inspiring work. beautifully articulated work. Insightful, honest and remarkable in its simplicity. My only negative note is that it is, in two places, repeating media stories as if they are facts. Syrian chemical attacks have never been confirmed as to who used them. Only interested parties are claiming they ‘know’. Best respect for going there, in the first place, and drawing and writing all this as a result of your visit. It doesn’t mention chemical attacks. I do describe contemporary accounts of bombings in Afghanistan and Syria which are well documented. I researched both thoroughly before inclusion. But cheers! Yes! Admirable and deep but foremost powerful work. Makes the gobshites fearful too! Well done for going and being there in place of some of us like myself who haven’t.. I am puzzled as to why the people in this unofficial camp have not claimed asylum in France. It is easy to do – just make an application at the loca prefecture. A significant proportion of the camp residents have claimed asylum in France. It speaks volumes about the French asylum system that they are still living in these conditions – and this includes families with young children. Reasons given for not claiming asylum in France include attempting reunion with relatives in the UK, working for UK forces in Iraq and Afghanistan, and the, possibly mistaken, belief that the UK is a fair and safe country. Hello Kate. I am French and our English teacher has given us work on the jungle of calais and gave us the link to this website to help us. Your drawings are beautifully executed and I believe you’ve managed to show how miserable the people over there are very well. Thank you for your shrewdness.